Into August, the month when a lot of people go away and there is not so much happening in Abingdon. To dispel that impression three different people have sent me things happening in August. Wednesday, August 2 – MANCUNIA – Music At The Unicorn, Unicorn Theatre, Abingdon. 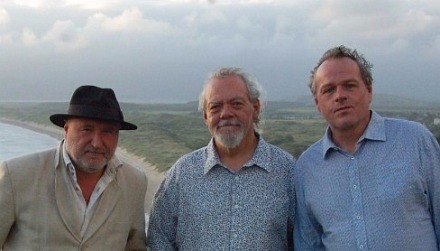 Tim O’Connor, a singer-songwriter based in France; Andy Dinan, twice All-Ireland Fiddle Champion; and Maartin Allcock, internationally acclaimed multi-instrumentalist who has played with the likes of Fairport Convention, Robert Plant, Cat Stevens and Jethro Tull, have joined forces to form MANCUNIA. 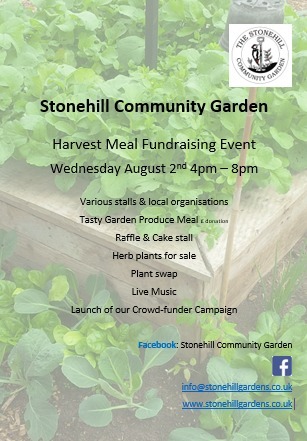 Weekly volunteer days every Wednesday 10am – 4pm, everyone welcome. 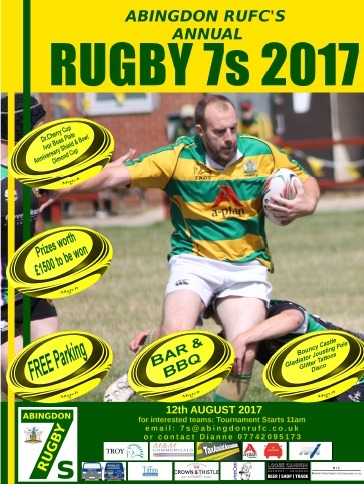 Then ten days later on August 12th is the annual Rugby 7s competition at Abingdon RUFC. Starts 11am. 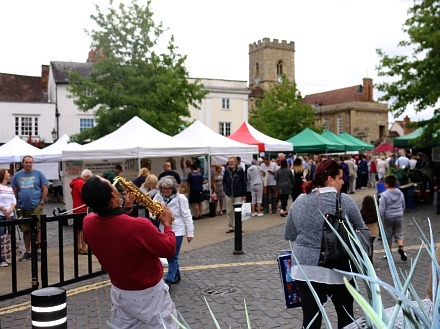 The Local Excellence Market was back on the Market Place today, and a sax player was playing with great gusto – getting a lot of money in his hat in return. 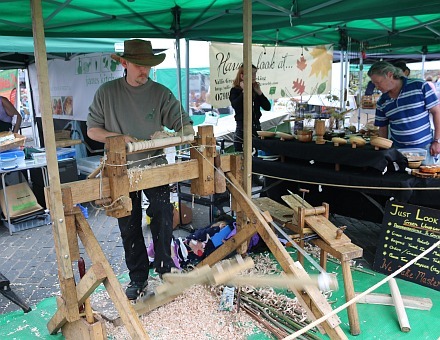 At the centre of the Market was the sight and sound of the wood turning demonstrations throughout the day where people could have a go. 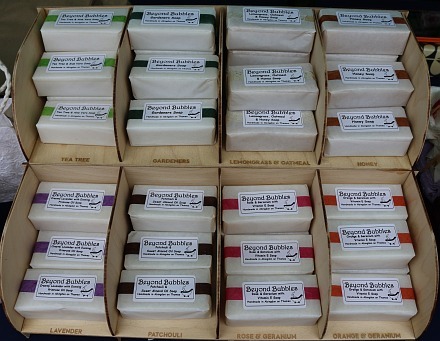 Beyond Bubbles had a new display stand for soaps. The section for patchouli, between lavender and rose & geranium. 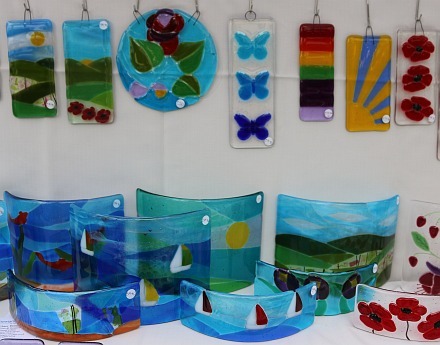 As well as scented soap there was coloured glass: blue seas and skies, green hills, red poppies, yellow sun, and the colours of the rainbow altogether. 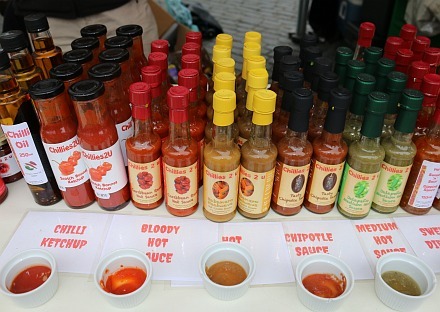 Then there were stalls with spices including gospice.co.uk and chillies2u , with spices ranging all the way up to ‘bloody hot’. Congratulations to the Abingdon Herald who this week celebrate their 150th anniversary. This notice appeared in other local newspapers in July 1867 to let people know of the new publication …. The Abingdon news that week saw Rev. 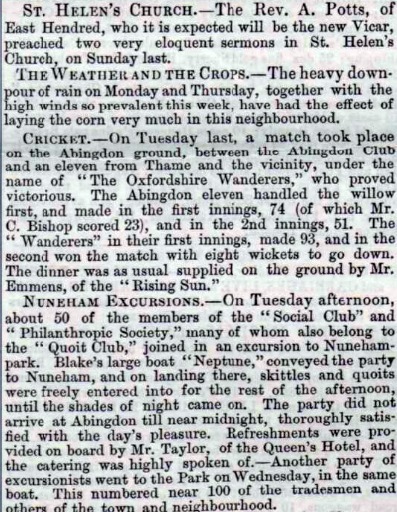 A. Potts preaching two eloquent sermons at St Helen’s; heavy rain flattening corn; Abingdon getting beaten at cricket; and an outing to Nuneham by the Abingdon Social Club and Philanthropic Society, where the members enjoyed quoits and skittles. 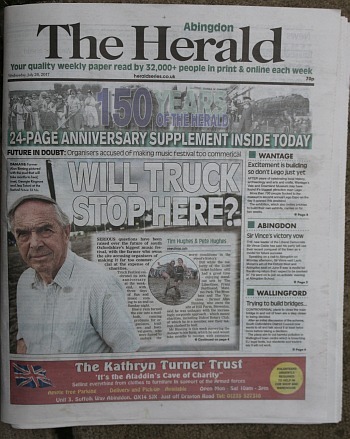 On the front page of the 150th anniversary edition we see that the Truck music festival at Steventon was very muddy after rain, and that there are concerns it is getting too commercial. Also that Vince Cable, the new leader of the Lib-Dems, visited Abingdon. 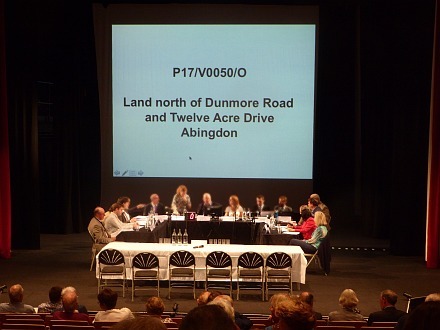 The postponed VWHDC (Vale of White Horse District Council) planning meeting to decide on outline planning permission for an estate of 800 houses north of Abingdon took place at the Amey Theatre in Abingdon School. The meeting had been postponed because the Environment Agency had an objection, which has now been overcome with some modifications to the plan by CEG, the developer, who we learned had been working on this scheme for several years, and even worked closely with the VWHDC to get the VWHDC local plan adopted – which allows these 800 houses. A government announcement earlier today removed the issue that could have held up the plan . It was dependent on the south facing slipways to the A34 at Lodge Hill being built to ease traffic in Abingdon. That slipway scheme will now receive about £9.45m over four years from central government. And central government has further funds to help open the way to new developments, allowing Oxfordshire County Council to feel confident they can ‘forward fund’ the rest – even before developer funding becomes available. 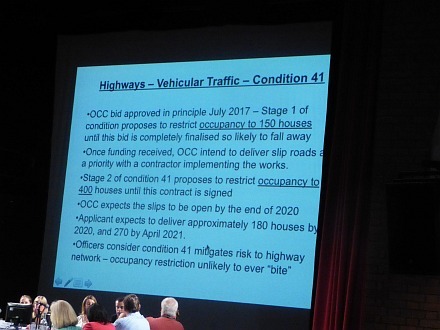 Oxfordshire County Council are now saying the slips could be open by the end of 2020. 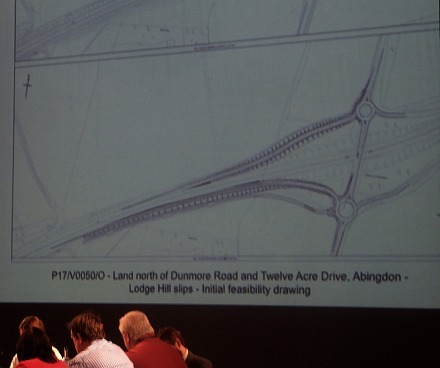 After the news of the A34 Lodgehill Diamond Interchange the rest of the detail was largely nodded through by the committee in a unanimous vote to allow the 900 houses. People speaking against had asked that no houses be built until the new slipway to the A34 is built. 400 houses will be allowed. It was noted by objectors that the number of houses has now gone up from 800 to 900. Somehow that was explained by the council officer as being only ‘up to 900′. There will be less 2 bedroom houses, and more 3,4 and 5 houses. That was explained by the council officer as market forces. On the positive side there was a commitment by CEG that 35% of the total will be affordable housing. There will also be a central area with primary school, community hub, and shop(s). CEG were praised even by some objectors for listening to the community, and said they would continue to listen.